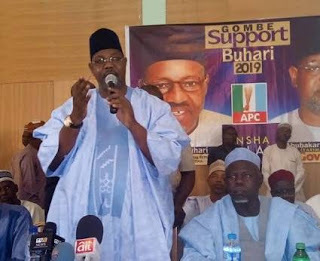 Abubakar Habu Muazu who is a chieftain of the All Progressives Congress (APC) has expressed confidence in the party winning more states in 2019 than it did in 2015. In an interview with Independent, the Gombe state governorship aspirant said he was contributing his quota towards strengthening the party in the state. He said: “As part of my effort to make the party relevant and well rooted in the state, I recently gave out funds to the party to rent offices in all the electoral wards and local government areas of the state in order to have a strong support base for the re-election bid of President Muhammadu Buhari. “Don’t get me wrong, I still maintain that stand that money politics should be discouraged, people should be elected based on their integrity and contributions to the well being of the people. However, it is not all about me, but about building a viable party that is well accepted by the people, a party that can stand the test of time and pull the crowd to itself. You should know that there is no way I can achieve my dreams and aspirations without having a strong platform, therefore one must be willing to sacrifice in building and uniting our great party in the state before one can start talking of his aspirations. “There are people that are also eyeing the governorship seat that is far richer than I am. One thing though is the fact that I am doing this not because I am a desperate person who wants to be a governor at all cost or because I am rich but because I believe in the vision and mission of President Muhammadu Buhari and the APC to salvage the country. “This is why during my meetings and consultations with party leaders, I always advise them to be wary of politicians that will try to buy their conscience with money. If they collect such monies, they are mortgaging their future and that of their children. I encourage them to assess the antecedents of the aspirants, considering their contributions to the society and the development of the party before making the decision on whom to support. Go and ask those that know me, they will testify to the fact that I am not doing this because I want to contest an election. “I am a true politician and a grassroots mobiliser, a giver right from my childhood. It is something that I inherited and you cannot take that away from me. It is not about having lots of money, you can have a little and decide to share to touch lives and you can have plenty and decide to keep it to yourself. For me as a politician, I value people and I care about their needs, which is why every time you come to my house you see people and I always reach out to them. That is why I do all my activities openly; I don’t wait until night then call some few people and we lock ourselves in a room in the name of political meetings. Politics is for the people and not a cult for a selected few” . The APC chieftain expressed confidence that the APC will dominate the polls in 2019. Meanwhile, Senator Shehu Sani (APC-Kaduna) says the APC must put its house in order to emerge victorious in the 2019 elections. He disclosed this while speaking on Saturday, March 17, at the 5th Olalekan Olomide Platform for Development held at the Nigeria Union of Journalists (NUJ) Press Centre, Iyanganku in Ibadan.